Vectrex is a video game system distributed by GCE (General Consumer Electric). It is unusual because of two things: First, it has a built-in display, common only among handheld consoles. Second, the display is vector-based, whereas all other consoles were raster-based. The main difference between raster-based and vector displays is that the raster displays update "chunks" on the screen (such as sprites, background tiles), while vector displays draw lines. When programming the Vectrex, you are essentially controlling a beam of light which starts out pointed at the centre of the screen, from there, you can start drawing lines, and moving the beam around. 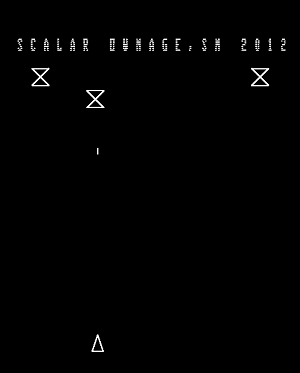 In Scalar Ownage, you can see how after each part of the screen is drawn, I bring the beam to the centre of the screen. Also, the coordinate system is Cartesian. The centre of the screen is (0,0), with positive x towards the right, and positive y upwards. Contrast this with all other consoles, where the top left of the screen is usually (0,0), with positive y downwards. Also, raster based consoles do not usually have a notion of negative coordinates, whereas Vectrex uses them regularly. The video output is monochrome, with varying intensities of white. Vectrex games included and relied on coloured plastic overlays which were attached on top of the screen, to create more attractive backgrounds. Scalar Ownage is more of a tech demo than an actual game. Keep shooting at the animated shapes until all are destroyed. It showcases things like reading the joystick, drawing, using different scales (which works nicely for animation), outputting text, and rudimentary collision detection. - If you build and run your code from a console, you will notice you will get errors during compilations after the first. My solution was to execute build.bat from Windows Explorer (double clicking it). - Loop counters break things when they are used as array indices. My solution worked for such a small scale program, but would not be appropriate for full-featured games; I chose to duplicate a few lines of code instead of using loops, just because the loops were predictable and tightly bounded. - rom - the compiled rom. Play it in any Vectrex emulator. - source code - good starting point for your Vectrex homebrew development. Requires the vectrexc dev kit.